Everybody knows about self-driving cars (no, you can’t sleep behind the wheel, or in the backseat), but how about a pilot-less air taxi? 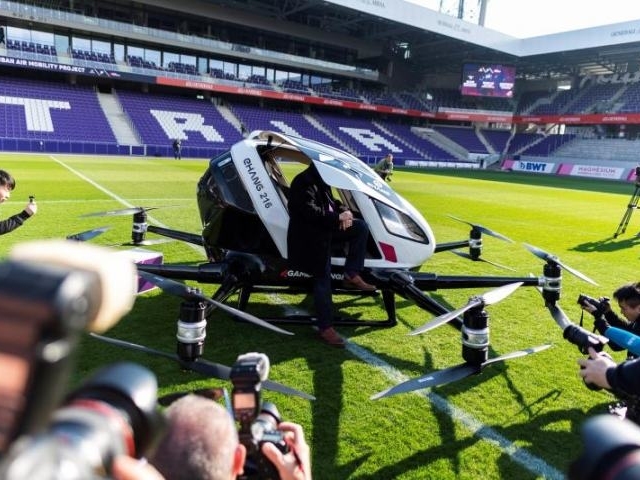 The EHang 216 was unveiled for the first time in Austria yesterday, with the air taxi hovering above the pitch at Vienna’s Generali Arena, the stadium of football club Austria Wien. It can seat two passengers, and Derrick Xiong, co-founder of Chinese drone maker EHang, says it’s now ready for mass production. Given what we know about Boeing and how their computer caused the fatal crash last month, it’s a no from me. …FACC says it has already received several thousand orders for the 300,000 euro ($336,000) drone, with the highest demand in China. Here’s hoping we don’t have to write about any accidents in the near future.